The STOPIT research group, led by Drs. 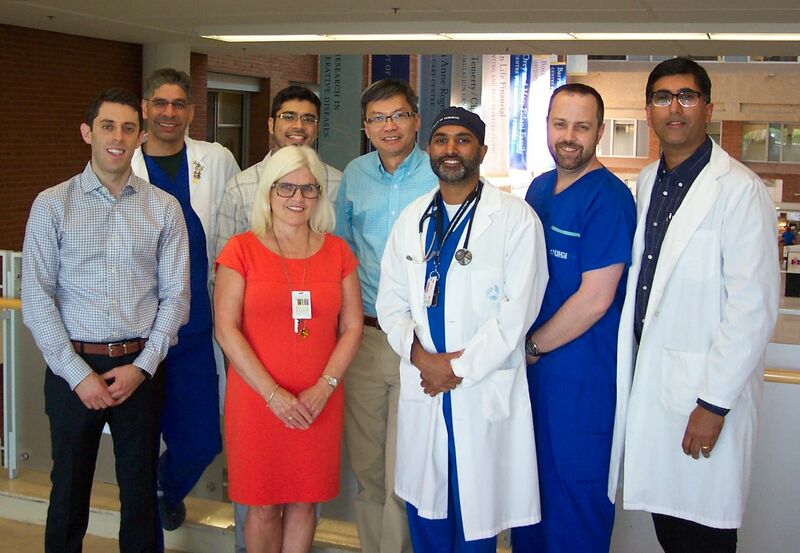 Anuj Bhatia and Philip Peng, based in the Departments of Anesthesia & Pain Medicine at Toronto Western Hospital, Princess Margaret Hospital, Mount Sinai Hospital and Women’s College Hospital. It is comprised of a group of clinicians and researchers (anesthesiologists, pain physicians, anatomists) supported by research staff. Their expertise is over the spectrum of acute, peri-procedural and chronic pain. Research methodologies including proof-of-concept investigations, clinical trials, observational studies, retrospective analyses, systematic reviews, meta-analyses, and population based studies are being used by this group. Investigational models for therapeutic interventions range from anatomy specimens to subjects with persistent, neuropathic pain. Evaluation of ultrasound against anatomical landmarks and fluoroscopy for interventional pain procedures, predicting and measuring benefit from intravenous ketamine infusions through use of validated questionnaires and functional MRI in refractory neuropathic pain, and ascertaining benefit from spinal interventions through synthesis of available evidence are some of the current research foci. Both Dr Bhatia and Dr Peng have published several manuscripts, book chapters, and books on assessment and treatment of pain. They also organize several workshops and academic events to increase awareness of recent advances in treatment of pain. Bhatia A, Bril V, Brull RT, Perruccio A, Wijeysundera D, Alvi S, Lau J, Gandhi R, Mahomed N, Davis AM. Study protocol for a pilot, randomized, double-blinded, placebo controlled trial of perineural local anesthetics and steroids for chronic post-traumatic neuropathic pain in the ankle and the foot: the PREPLANS study. BMJ Open. 2016:e012293. Bhatia A, Peng P, Cohen S. Radiofrequency procedures to relieve chronic knee pain: An evidence-based narrative review. Regional Anesthesia and Pain Medicine. 2016;41:501-10. Khan JS, Rai A, Sundara Rajan R, Jackson TD, Bhatia A. A scoping review of perineural steroids for the treatment of chronic postoperative inguinal pain. Hernia. 2016;20:367-76. Bhatia A, Flamer D, Shah PS, Cohen SP. Transforaminal epidural steroid injections for treating lumbosacral radicular pain from herniated intervertebral discs: A systematic review and meta-analysis. Anesth Analg. 2016;122:857-70. Bhatia A. Ketamine as an adjunct to patient-controlled analgesia: why, for whom, and how much? Can J Anaesth. 2016;63:262-267. Bhatia A, Flamer D, Shah PS. Perineural steroids for trauma and compression-related peripheral neuropathic pain: a systematic review and meta-analysis. Can J Anaesth. 2015;62:650-62. Soneji N, Bhatia A, Seib R, Tumber P, Dissanayake M, Peng PW. Comparison of fluoroscopy and ultrasound guidance for sacroiliac joint injection in patients with chronic low back pain. Pain Pract. 2016;16:537-44. Bhatia A, Gofeld M, Ganapathy S, Hanlon J, Johnson M. Comparison of anatomic landmarks and ultrasound guidance for intercostal nerve injections in cadavers. Reg Anesth Pain Med. 2013;38:503-7. Bhatia A, Brull R. Review article: Is ultrasound guidance advantageous for interventional pain management? A systematic review of chronic pain outcomes. Anesth Analg. 2013;117:236-51. Bhatia A, Flamer D, Peng PW. Evaluation of sonoanatomy relevant to performing stellate ganglion blocks using anterior and lateral simulated approaches: An observational study. Can J Anaesth. 2012;59:1040-7. Alex Mu, Philip Peng, Anne Agur. Comparison of Landmark and Ultrasound guided approaches for Trochanteric bursa injection: a cadaver study. Anesthesia and Analgesia. 2016 Dec. In Press. Arthur Worthington, Philip Peng, Kevin Rod, Vera Bril, Jahan Tavakkoli. Image-guided High Intensity Focused Ultrasound (HIFU) System for Large Animals Nerve Ablation Studies. IEEE Journal of Translational Engineering in Health and Medicine. 2016 Dec. In Press. Burckett-St Laurant D, Peng P, Girón Arango L, Niazi AU, Chan VW, Agur A, Perlas A. The nerves of the adductor canal and the innervation of the knee: An anatomic study. Reg Anesth Pain Med. 2016;41:321-7. Philip Peng. The known knowns and known unknowns of chronic pain. Can J Anesthesia 2016; 63:386-391. Peng PW. Ultrasound-guided interventional procedures in pain medicine: a review of anatomy, sonoanatomy, and procedures. Part IV: hip. Reg Anesth Pain Med. 2013;38:264-73. Philip Peng, Nellish Soneji. Ultrasound guided intervention for pain management. (Editorial). Pain Manage. 2014 Apr 1;4(1):13-15. Principal Author. SonejiN, Peng PW. Ultrasound-guided interventional procedures in pain medicine: A review of anatomy, sonoanatomy, and procedures: Part VI: Ankle joint. Reg Anesth Pain Med. 2016;41:99-116. Greher M, Moriggl B, Peng PW, Minella CE, Zacchino M, Eichenberger U. Ultrasound-guided approach for L5 dorsal ramus block and fluoroscopic evaluation in unpreselected cadavers. Reg Anesth Pain Med. 2015;40:713-7. Peng PW, Shankar H. Ultrasound-guided interventional procedures in pain medicine: a review of anatomy, sonoanatomy, and procedures. Part V: knee joint. Reg Anesth Pain Med. 2014;39:368-80.